A quality traditional radiator with a 5 bar insert and stylish ball joints, with it's classic design this radiator would look great in any bathroom. Manufactured to the highest standards and constructed from strong chrome plated durable steel. It delivers excellent heat and is ideal for warming towels when in the bath or shower. Supplied with fixings. Not used yet but looks exactly as expected. Good looking and very functional. 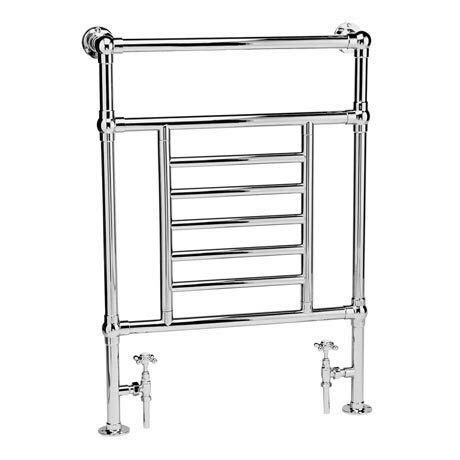 we had looked around for some time for a narrow towel rail in chrome as we have a very slender ground floor cloakroom and the prices seemed very high for what we were getting. Then by chance google took us to Victoria Plumbiing who not only had what we wanted, but had it on a very good offer price and in stock, reviews looked good so we ordered. Very satisfied with service, order was processed easily, postage more than reasonable and delivery time excellent. We are still awaiting the room to be plastered before fitting, but the towel rail looks superb in situ and solid and well finished.It was also good to receive well packaged goods, nothing missing and all looks good so far.Would not hesitate to use this company again.